On the 100th anniversary of his birth, a celebration of the extraordinary life of Ezra Jack Keats, creator of The Snowy Day. Andrea Davis Pinkney's powerful and poetic text tells the story of Ezra Jack Keats, who was born in Brooklyn in 1916, and grew up in extreme poverty. Keats's artistic talent was recognized even in high school, but his father's death made it impossible for him to accept the art school scholarship he was offered; however, Keats continued to study art informally whenever possible. He served in the army in World War II and subsequently lived in Paris, Eventually, Keats found his way to children's books, and with the groundbreaking Caldecott winner The Snowy Day, the first mainstream picture book to feature an African American child, he became part of children's literature history. Keats's best-loved books are the ones that portray the neighborhood where he grew up. He was an inspiration to many artists of color, who, for the first time, saw themselves reflected in his books. The Ezra Jack Keats Foundation was established after his death, with the goal of promoting more diverse books and helping new authors and illustrators. A perfect match for the text is the art of Steve Johnson and Lou Fancher, who use a colorful collage style to suggest Keats's own art. 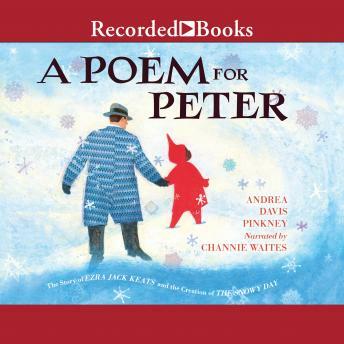 With beautiful writing from a distinguished author and about a distinguished author/artist, A Poem for Peter has the potential to be an award-winner.